The NewAir AWR-290DB-B wine cooler is a 29 bottle dual zone wine cooler. This model has a black stainless steel finish on the front. 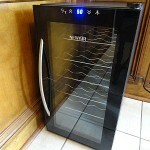 A similar model, the AWR-290DB wine cooler, is the same, but with the typical stainless steel front. The advantage of the AWR-290DB-B wine cooler is it can be free standing or built-in underneath a kitchen counter. The wine cooler arrived double boxed which provided plenty of safety. There was a little dent on the side of the outside box, but with the double box and use of Styrofoam and cardboard corners, the wine cooler was safely protected. The next task was assembling the wine cooler with minimal assembly required following the Quick Start Guide. The door’s handle had to be attached, and unfortunately there was a little ding on one end of the handle where the black finish exposed the steel. 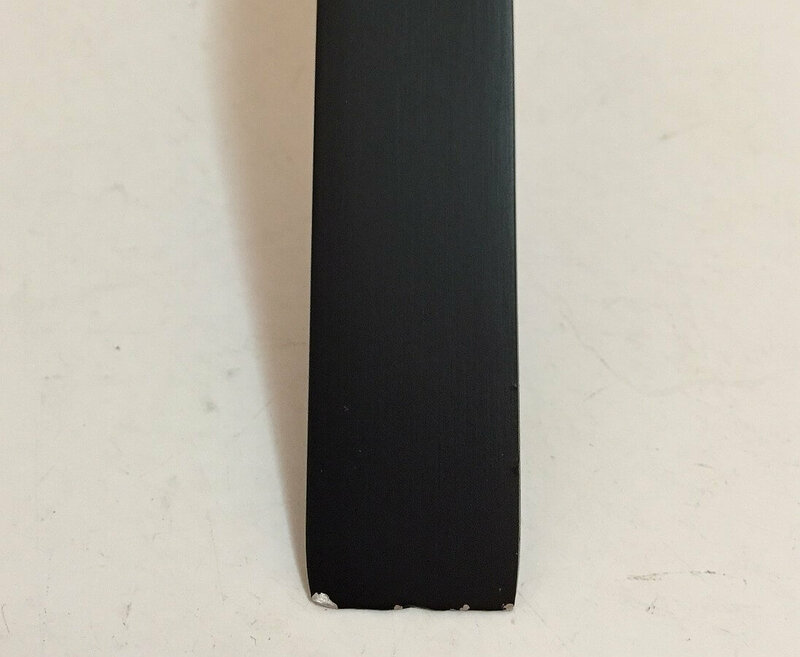 Since the ends of the handle are the same, it was a simple task to put the steel part at the bottom of the door so it wasn’t noticeable, especially after a little flat black paint was used to touch it up. One of the parts left over was another hinge system to use on the door if you wanted to reverse the door, so it opens to the left instead of the default right. I did not need to do this with my planned location, but if you did reverse the door, the NewAir logo on the front of the glass door would be upside down. It should be a simple matter to remove it by peeling it off the glass and flipping it around if desired. The only remaining parts were a mystery. 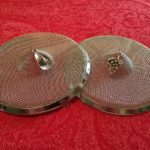 There were two plastic containers of different sizes and the Quick Start Guide nor the Owner’s Manual stated what they were or what they were used for. After searching around the wine cooler, I discovered a recessed area at the inside bottom where the larger cup fit. I have owned multiple wine coolers over the years that never had this recessed area, and I never had anything drip or spill inside. 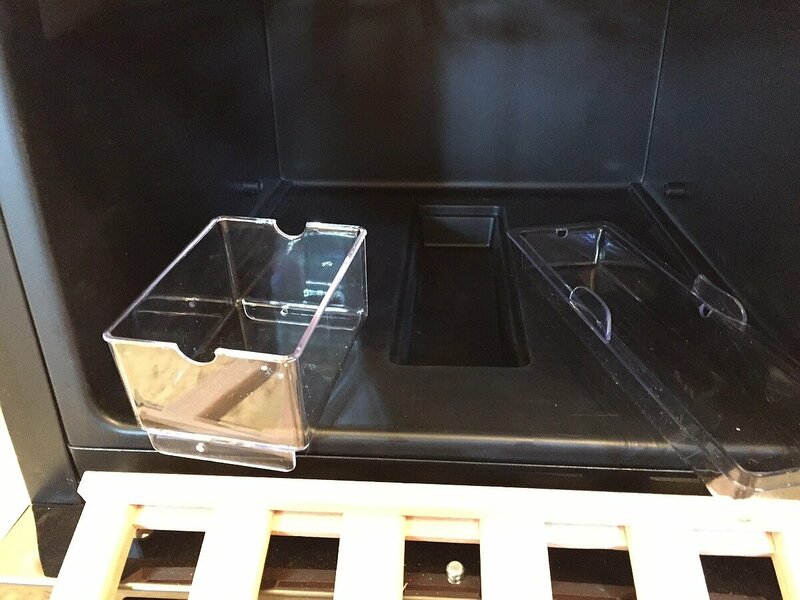 I guess if there was a drip or spill from above, and you did not want to wipe out the recessed bottom area, you would just have to pull out the inserted plastic container instead. That left the smaller container for which I could not find a use. Since I was doing a review, I decided to call NewAir support to get an answer. I was on hold for 12 minutes and decided to email instead. This was on the day after Thanksgiving and I was sure that support was busy that day. On the next business day, I received an answer to my email about the container. 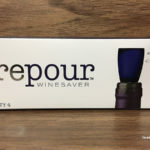 The small container is a moisture cup to be used for moisture beads to prevent mold in the wine cooler. There is an excellent article on the NewAir website about how to prevent mold. NewAir support has always been rated highly, and I would have to give a thumbs up in order to get my answer. It was time to move the wine cooler to where I was going to use it. As mentioned previously, the NewAir AWR-290DB-B wine cooler can be built-in, but I was going to use it as a free standing wine cooler. The front venting is what allows the wine cooler to be used under a counter. 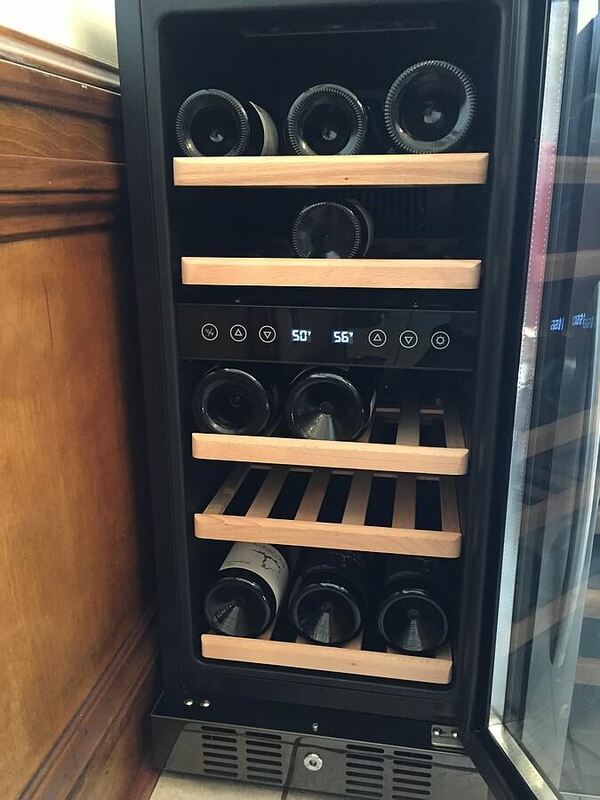 In fact, if you look at the wine cooler, it is very much the same in design as a much larger wine fridge. 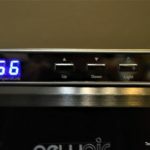 If you are going to use it built-in, the cooler is built to a standard counter height and depth. If you happen to have a house that came with a kitchen trash compactor, the wine cooler is about the same size, so that spot makes a perfect location to put the wine cooler instead. The measurements of the wine cooler are 22.5 inches deep, 14.81 inches wide, and 33.63 inches high. 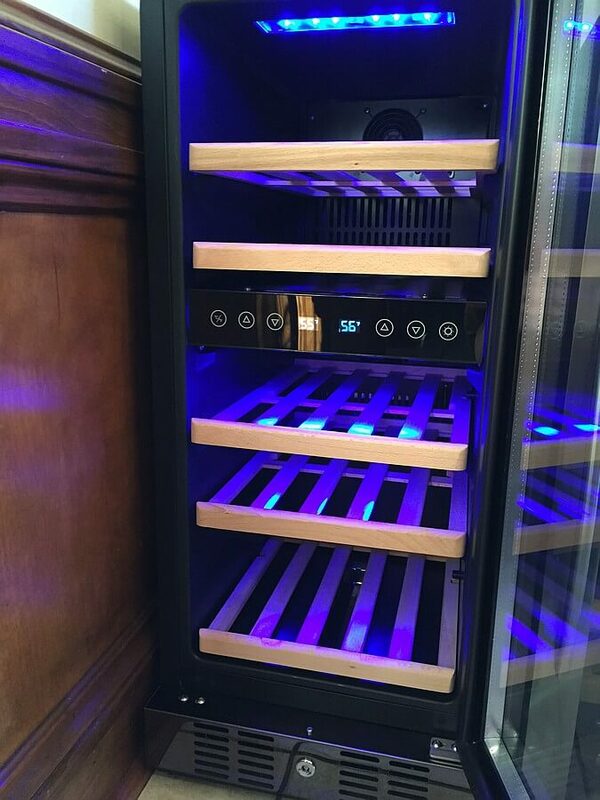 If you are looking for a built-in wine cooler, the NewAir website has photos showing how nice it looks. I placed the cooler where it was to be, and if I needed to, the feet can be adjusted to level the wine cooler. The next step was the hardest, which was a recommendation by NewAir to let the wine cooler stand upright for approximately two hours before operating. This is to reduce the possibility of a malfunction in the cooling system from handling during transportation. While waiting, I looked closer at the removable wood shelves which allows you to customize the storage in the wine cooler. The wine cooler is said to hold 29 bottles, so while waiting, I tried inserting some of the bottles I had planned on using in the wine cooler. 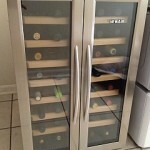 Like every wine cooler and wine fridge I have ever used, in order to store the maximum number of bottles the manufacturer states, you really need to have the perfect size bottle. As we previously wrote about wine bottle sizes, the perfect size bottle for a wine cooler is the standard Bordeaux style bottle. Unfortunately, most people do not have all bottles of this size. With the right bottles, I was able to fit three bottles in the front of a shelf and two in the back. So with a total of five bottles per shelf and five shelves, that gives a total of 25 bottles. However, the large bottom shelf can have bottles stacked on top of each other, and there is also a larger spaced shelf on the top. So it may be possible to get to the 29 bottles, although I did not have enough perfect sized bottles to try. Coming back to the cooler after the two hours, I plugged it in and set the dual temperatures. 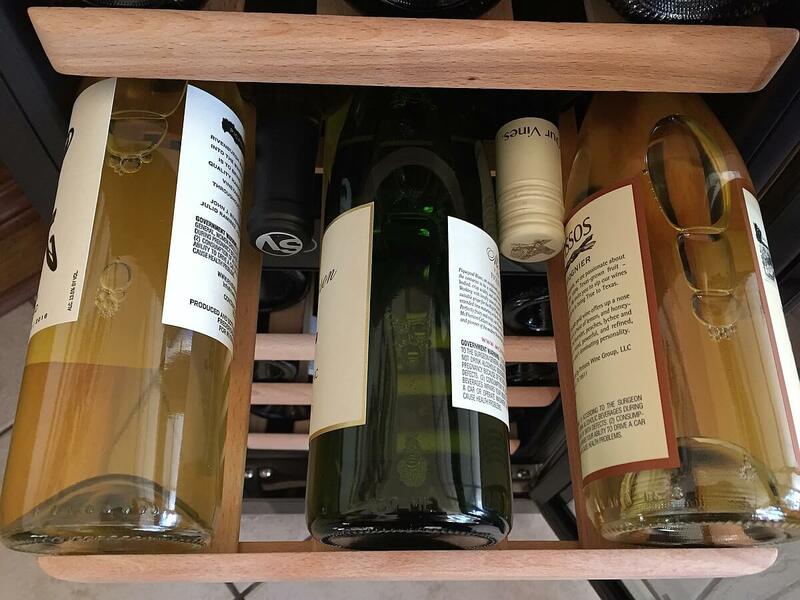 The top section for white wines can be set from 40 to 50 degrees, and the bottom section for red wines can be set from 50 to 66 degrees. It would be nice if the upper temperature was able to go a little higher if desired. I was surprised how quickly the temperatures I had set reached my desired settings. The light switch was a little different, because in other wine coolers, the light switch is usually on and off. 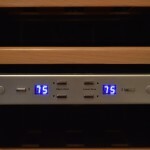 The NewAir AWR-290DB-B wine cooler’s light has three settings: high, low, and off. That was nice. There is a door safety lock at the bottom which you can use to keep children, or perhaps your wine loving friends, away from your wine collection. The triple pane insulated glass helps to keep the temperatures inside the cooler. I have waited to write this review, because I wanted to ensure it has been working fine, and I can say proudly that it has. The temperatures I set from the beginning have remained rock solid, and are consistent with the actual temperatures inside the cooler. The NewAir AWR-290DB-B wine cooler has a very quiet compressor making the cooler attractive, quiet, and efficient. NewAir provides a one year limited manufacturer’s warranty. Can you explain the hole in the top middle of the door? It came with a black plug which fell inside the hole when I touched it. I have no idea how to retrieve it or what to use the hole for. Thanks—love your reviews! Hi Angela, if you reverse the door so it opens from the other side, that top hole becomes the bottom hole which is for the bolt locking mechanism. If you look at the bottom of the door, you should see the same type of hole. I’m not going to push mine in, but I would imagine you would need small needle nose pliers to get it out. Thanks for following! I ordered one this week. My concern is with service after the one year warranty. New Air told me there is no authorized service in the field and the unit has to be shipped back to them for repair. This would be very difficult. 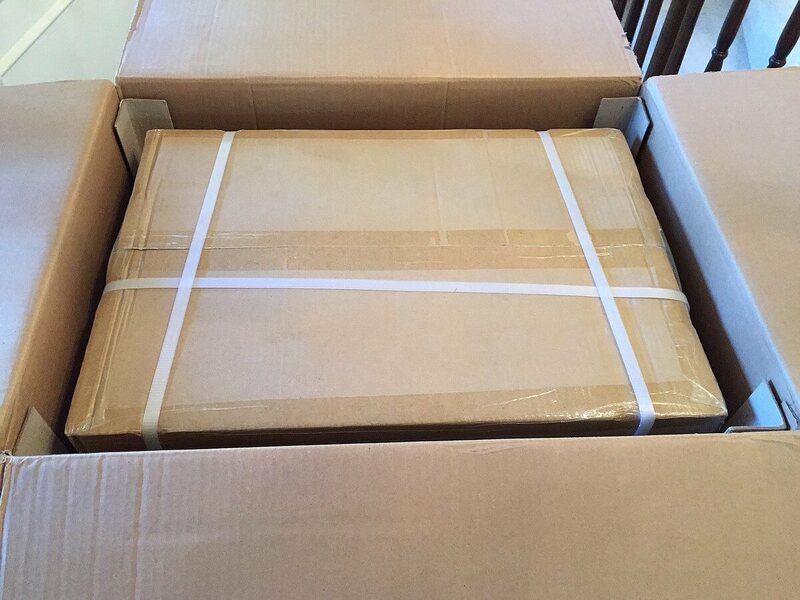 You need correct packaging, pay freight costs, etc. I have a Whynter that quit working after less than 4 yrs. and same situation. No local service in Tampa and have to ship back to their location in California. This not realistic. Yes, The seller, Amazon offered a 4 yr warranty for only $34. It’s from Square Trade. This is really a low price. If they can’t fix it, they will replace it and since there is no service in the field I presume it would be replaced. I hope you got it because that is a great price. The problem with consumer feed back is that it usually just covers the initial impression of the unit shortly after it was purchased. I would be better to see feedback after several years of use and issues with repair, warranty, etc. The unit actually measures slightly under 15 inches on the width.